Eyemaginations, Inc. has announced its latest software update for LUMA, the comprehensive patient education and marketing software platform for healthcare professionals. LUMA v1.9 features a wide variety of new healthcare topics across a number of medical specialties. “...we are providing the appropriate combination of education and marketing for healthcare professionals in the most technologically savvy way at the most economical price," said Jeff Peres, president and CEO of Eyemaginations. Eyemaginations, Inc. has announced its latest software update for LUMA, the comprehensive patient education and marketing software platform for healthcare professionals. LUMA v1.9 features a wide variety of new healthcare topics across a number of medical specialties. The new topics include subjects such as Lid Hygiene, Macular Degeneration, Meibomian Gland Dysfunction, Blepharoplasty, Facelifts, Laser Skin Resurfacing and Rhinoplasty. The system also includes commercials and media from vendors such as Alcon, Hoya, and Zeiss. 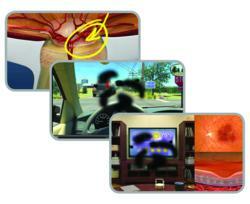 Eyemaginations LUMA is the most innovative form of patient education and marketing software available. With LUMA, doctors can ensure that patients understand their conditions and treatments. Concurrently, the practice can market premium products and services while saving time and increasing productivity. And when used with the Eyemaginations full suite of products including ECHO and Online, doctors can create the perfect solution with LUMA to increase education, drive revenue, and maximize their time spent with patients. Also, new in LUMA v1.9 is the introduction of split-screen views offered within the Exam Advisor on such topics as refractive errors, macular degeneration, glaucoma, and cataracts. These unique animations allow for simultaneous views of both condition development and point-of-view perspectives for selected conditions. Finally, Eyemaginations is pleased to announce the launch of its vignette offering. These silent waiting room segments are designed to provide specific messaging and call-to-action language for patient marketing. Enhanced tutorial videos have also been added to ensure that LUMA users are maximizing their software to its fullest potential. For additional information about LUMA v1.9 or for a full list of the latest software enhancements, please contact Eyemaginations by calling 877.321.5481, emailing info(at)eyemaginations(dot)com or by visiting http://www.eyemaginations.com. Eyemaginations, Inc. is a healthcare media company focused on patient education solutions that support professionals, patients and corporations in communicating and understanding complex topics. The company’s in-depth experience with animation, design and software has enabled Eyemaginations to create integrated systems that provide clear and concise education solutions. Eyemaginations has a portfolio of products that are focused on eyecare, ENT, audiology and facial aesthetics. Eyemaginations may be reached by phone at 1-877-321-5481, email at info(at)eyemaginations(dot)com or online at http://www.eyemaginations.com.